What It’s About: Dr. Peter Blood (Errol Flynn) is an Irish doctor who makes the mistake of helping a wounded rebel during the rebellion against James II. Exiled in Jamaica, Blood and the surviving revolutionaries are sold at a slave auction. Dr. Blood plans an escape with the former rebels, which fortuitously occurs during a Spanish attack. Blood and his men capture one of the Spanish ships and become pirates, the scourge of the Caribbean, until war between England and France presents them a choice: do they aid their former country or remain neutral pirates? Why Watch it Today? : Today be International Talk Like a Pirate Day, mateys, so why not sit down with some grog and one of the greatest pirate yarns of them all. Ya won’t be disappointed. 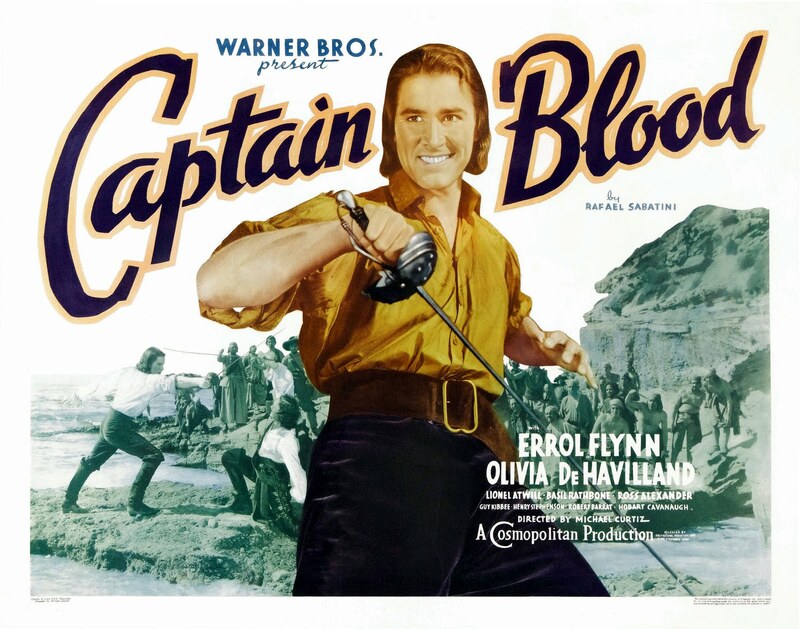 This entry was posted in Adaptation, Adventure, Based on a Book, Black and White, Movie of the Day, Period Film, Pirate, Swashbuckler, The Original and tagged Basil Rathbone, Best Adapted Screenplay Nominee, Best Director Nominee, Best Music Nominee, Best Picture Nominee, Best Sound Recording Nominee, Britain, doctor, Donald Meek, Errol Flynn, France, Guy Kibbee, Hal B. Wallis, Hippocratic Oath, incompetent doctors, J. Carrol Naish, Jack L. Warner, Jamaica, Lionel Atwill, Michael Curtiz, Olivia de Havilland, prison break, slavery, Warner Brothers.